The new MARK FIVE: 25™ provides a “greatest hits” collection of our renowned Mark Series preamp circuits served up with a brash new attitude all its own packaged in a unbelievably small size! In this latest 25 watt incarnation, the sounds and attributes that make MARK Series amps so popular on stage and in the studio are not only shrunk to their smallest possible physical size, but are also further refined and improved. The gorgeous sparkling Cleans and soaring high gain Lead sounds have made the jump successfully across output tube platforms and a new and exciting timbre of the MARK Series voice is created here in the MARK FIVE: 25’s EL84 Duet. Brighter, tighter, more shredding in the top end, a bit more forgiving in feel and exceedingly more clip-able, the FIVE: 25 is right on time. Whether introducing the MARK heritage to a new generation of low wattage devotees, or fulfilling the ultra-portable Tone Dreams of steadfast MARK Series fans, the MARK FIVE: 25 has got what it takes to inspire and fuel your passion in the most manageable package ever! The MARK FIVE:25, like the MARK FIVE it is born from, is really a collection of iconic amplifiers. 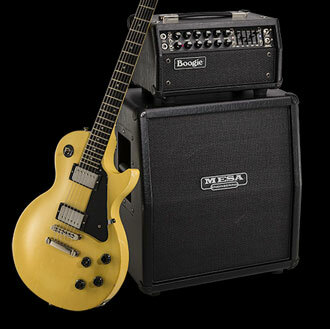 There are far too many circuits and sounds to think of it as merely an amp... it’s a living history of MESA/Boogie! The MARK FIVE: 25™ is born of thoroughbred stock that carries worldwide accolades and is still setting trends with top Artists 35 years after its unveiling. The MARK FIVE: 25, like the MARK V™, is really a collection of iconic amplifiers. 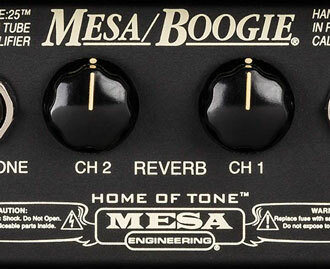 There are far too many circuits and sounds to think of it as merely an amp... it’s a living history of MESA/Boogie! From the groundbreaking MARK I™ that introduced the world to high-gain with it’s cascading preamp, to the MARK II™ - the world’s first high gain Dual Mode Channel Switching amplifier (and its later siblings that introduced Simul-Class™ power). From the MARK III™ that ushered in the era of 3 Channel footswitching performance, to the MARK IV™ which gave all that power individual control, the MARK V (and now the FIVE: 25) is the embodiment of the last 45 years of guitar amp evolution. Packing the legendary preamp TONE, stylistic versatility and aggressiveness of the MARK IIC+™, MARK IV and MARK V, the new MARK FIVE: 25 combines the power of our most famous Mark Series preamps with our exclusive Dyna-Watt™ 2xEL84 power section to create a new Mark Series amp of unprecedented portability, clip-ability and high-speed, tactile expressiveness. The result is a new bench-MARK, every bit worthy of its ancestor’s storied heritage. This Channel incorporates our best two Clean Modes ever, CLEAN and FAT from the MARK V. These Modes offer two musically useful flavors of this sparkling low gain voice that benefit from 35 years of continuous refinement and take Clean sounds to a dynamic, new touch-sensitive plateau. 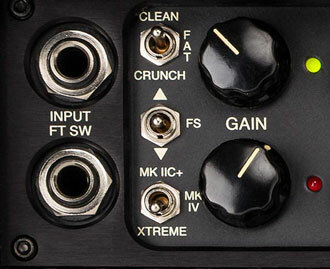 A third “crossover” Mode (CRUNCH) is also showcased here in Channel 1 and again, it’s taken directly from the acclaimed MARK V.
The CRUNCH Mode covers the mid-gain ground between Clean and mildly overdriven and ultimately, with this power section, on up to the higher gain sounds of its namesake. CRUNCH by itself is worthy of—and delivers more than—most stand-alone amplifiers. Also, here in the FIVE: 25, CRUNCH is enhanced by the ability to blend in more power section clip at lower volumes due to its lower wattage range. The EL84s accentuated top end harmonic content adds a nice openness to lower GAIN settings and Brit-voiced shred to the higher GAIN range, making CRUNCH even more applicable and valuable. You will likely find it one of the most useful Modes of all in this MARK’s arsenal. 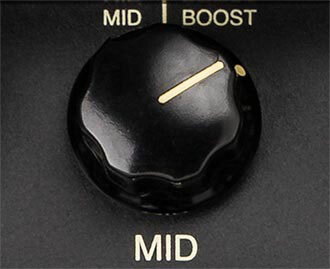 From 0 to 5.0 on the MID/BOOST you will find the normal range of a standard MID control in a condensed form. From 5.0 to 10 on the MID/BOOST a wonderful graduation of overdrive possibilities unfold that enhance gain over a wide midrange spectrum and saturate with increasing thickness. Channel 1 in the MARK FIVE: 25 is also fitted with an additional (patent applied for) MID/BOOST feature that increases both the gain and flexibility in all three of its Modes. What was a switchable On/Off Gain Boost feature on the original MARK I appears here as an adjustable MID/BOOST found on the MID Control. From 0 to 5.0 on the MID/BOOST you will find the normal range of a standard MID control in a condensed form. From 5.0 to 10 on the MID/BOOST a wonderful graduation of overdrive possibilities unfold that enhance gain over a wide midrange spectrum and saturate with increasing thickness. The dial-to-taste smooth, warm overdrive found in the MID/BOOST transforms Channel 1 into a full featured (high gain) amplifier all its own and offers HUGE potential for great solo and overdriven rhythm sounds across a wide range of styles. The top Mode of Channel 2 (the MK IIC+ Mode) is an exact recreation of the iconic MARK IIC+ LEAD Mode and offers the blistering midrange focus and searing top end of this classic 30 year-old circuit. Its urgent attack and tight midrange focus provide the perfect canvas to create, especially huge Rock and Metal sounds, with another iconic MARK feature... the on-board Boogie® Five-Band Graphic EQ. Many Heavy Rock aficionados find the MK IIC+ Mode with the EQ employed their go-to sound for aggressive high gain rhythm work. For the rest it provides an articulate, singing high gain voice with tons of mid-focus clarity from which to craft your signature Lead voice. Channel 2’s middle Mode, the MK IV Mode, is another exact recreation, this time of the MARK IV’s “Lead” Channel and it appears on both the 6L6 MARK FIVE’S Channel 3 roster and here on the MARK FIVE: 25. This MARK IV Lead Mode is fatter and creamier than its mid-accentuated brother, offering a warmer voice that’s great for both single note soloing and high gain chording. It’s nicely juxtaposed to the pointed, more forward voice of the IIC+ and is supremely balanced and full bodied. Played with or without the Five Band EQ, the MK IV Mode is a great all around choice for so many styles, low or high gain, and would be ideal even as the only Lead Mode. Its warmth, balance and easy to play feel are the sonic anchor for Channel 3 in the EL84 powered MARK FIVE: 25. The XTREME Mode (bottom Mode) is also a faithful duplication and taken directly from the 6L6 MARK V. It definitely lives up to its name and delivers the radical dose of high gain infused with extra harmonics and even more urgent attack than its cousin upstairs, the IIC+ Mode. This hyper reactive voice jumps at the first hint of pick attack and roars with aggression. It’s further antagonized by the similar response of the EL84 power tubes here in the FIVE: 25 with their fast attack, higher mid frequency and relative lack of sub-low bottom end. XTREME shreds, grinds and thrashes like the angry teen it is circuit-wise and whatever it lacks in nuance, it makes up for in brash attitude. It’s very fast, forward and furious and should be used in musical environments where you don’t care if you offend and/or dominate... and in fact, may even be the goal. The on-board 5-Band Graphic EQ has been an iconic trademark of MARK Series Boogies since it first appeared on the MARK I back in 1970. The shaping power of this feature can’t be denied, especially when combined with the MARK II and IV’s tight, mid-focused gain sound. In the ‘80s the classic “V” setting of the Graphic EQ on MARK II and III models became an instant Classic. The Graphic EQ comes at the very end of the signal chain so you can shape the final sound with the only consideration being how much of a certain frequency your speakers, cabinet – and ultimately your ears – can handle. To the right of the Graphic EQ SLIDERS are the Multi-Watt™ Channel Assignable Power switches for each Channel. These allow selection of either the full 25 watts of Dyna-Watt™ power with its more-than-rated punch and impressive burst of headroom on the attack, or the brighter and oh-so-clip-able 10 watts of Class AB Triode power. Dyna-Watt is the choice for most gigging or rehearsing with others and provides the maximum volume for clean sounds and the tightest tracking response for high gain rhythm work, especially in the low end. The 10 Watt setting flips the 2xEL84s over to a CLASS A/B Triode wiring configuration that offers an opposite power response to Dyna-Watt along with greatly increased clip-ability. It produces a skinnier, slightly brighter response and is the same low power scheme used in our Mini Rectifier® 25 for its ability to track many styles and it’s the perfect fit for the 6 versatile preamp Modes here in this MARK rendering as well. The 10 Watt setting is great for lower volume practicing, rehearsing and recording and allows more use of the power section as a gain source, enabling you to reduce the preamp’s GAIN Control settings and explore the old school approach to achieving tube overdrive... power saturation. 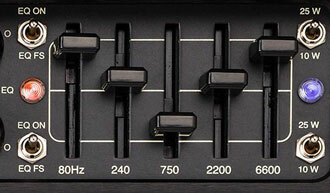 The first feature of note starting at the far left of the rear panel is the Series, Buffered, Tube FX LOOP. 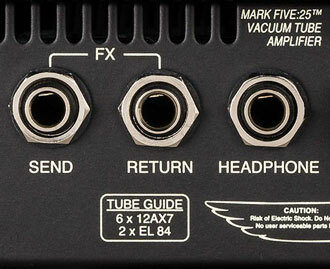 The MARK FIVE: 25 includes a HEADPHONE Output for personal enjoyment of the amplifier when it is not possible to play through a speaker. The Buffered, Tube FX LOOP is the interface point for outboard processing and it provides a junction between the preamp and power section. The LOOP performs well with both Rack and Pedal type outboard gear with the obvious exceptions being those effects that work better on the INPUT of an amplifier (Wah, Compression, Gain and Overdrive Pedals, Envelope Filters, etc.). Since it is buffered, you can use multiple units in line and relatively longer lengths of cable (25 feet or less) before hearing too much degradation in signal. The MARK FIVE: 25 includes a HEADPHONE Output for personal enjoyment of the amplifier when it is not possible to play through a speaker. This jack derives its “speaker simulated” signal from the included CABCLONE™ D.I. feature and delivers a surprisingly good rendering of the FIVE: 25’s sound and feel to your headphone set of choice. The Mark Five: 25 has independent REVERB Controls for each Channel. This allows different amounts of the all-tube, short-spring analog Reverb to be dialed in for each of the Mark Five: 25’s 2 Channels. Next up are the REVERB Controls and there is an individual MIX for each Channel. This allows different amounts of the all-tube, short-spring analog Reverb to be dialed in for each of the MARK FIVE: 25’s two Channels. Anything from a subtle background ambience to a fully drenched effect can be dialed according to taste and musical style. On-board CABCLONE D.I. Cabinet Simulation feature - This built-in magic allows you to capture a wonderful representation of the sound and feel of the MARK FIVE: 25 direct to a Console, Converter or even direct to a Recorder without the need to mic up the speaker. And last but DEFINITELY not least, is possibly the coolest feature ever to grace a MESA® Rear Panel, the on-board CABCLONE™ D.I. and Cabinet Simulation feature. This built-in magic allows you to capture a wonderful representation of the sound and feel of the MARK FIVE: 25 direct to a Console, Converter or even direct to a Recorder without the need to mic up the speaker. Taken directly from our acclaimed stand-alone CABCLONE, this compensated D.I. (and HEADPHONE Output) does an incredible job of capturing the signal from the SPEAKER OUTPUT and turning it into direct injection gold. The four elements here allow for use both with a live speaker and without, so you can blend the direct and a mic’d speaker cabinet if you so desire. 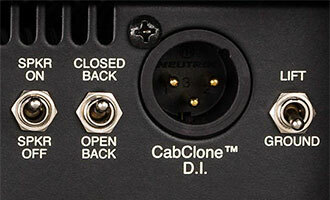 The CABCLONE section features switches for SPEAKER Status (OFF/ON), CABINET Style (OPEN BACK/CLOSED BACK), GROUND (GROUND/LIFT; Pin 1 Float) and an XLR BALANCED Output. This array of controls comprises perhaps the most valuable and welcome feature set on any MESA amp and expands both the functionality and enjoyment potential many fold. The MARK FIVE: 25 is the first of our amplifiers to include this powerful tool built right in for speedy and convenient live use or recording applications without sacrificing authenticity and Tone.